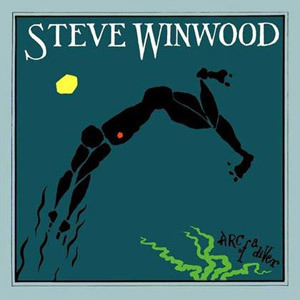 Arc Of A Diver, originally released in December 1980, is the second solo album recorded by Steve Winwood (Spencer Davis Group, Traffic, Blind Faith). The album was performed entirely by Steve Winwood himself. The bonus disc features three extra tracks; “Arc Of A Diver” (4:14 - the edited US single version), “Spanish Dancer” (6:08 - radio edit 2010 version) and “Night Train” (6:30 - instrumental version from the UK 12” single which has never been released on CD before. This version has extra guitar and keyboards and is much longer). Birmingham and it was there with his brother Muff, Pete York and Spencer Davis that he formed the group that was to have such seminal hits as ‘Keep on Running’ and ‘Gimme Some Lovin’. In 1967, Steve moved on to join Traffic, one of the most creative and enduring groups of the 60s and 70s. When Traffic eventually broke up, Steve played sessions with almost everyone in pop and rock. His first solo album came out in 1977 and with singles like ‘Valerie’ and ‘Higher Love’, he'd established himself as a kind of elder statesman of rock.